I’m happy to report that a post of ours on Reactive and Multiplatform Crowdsourcing has been featured on the renowned CrowdResearch blog (Follow the Crowd). The post puts the focus on the need of controlling the crowd in response to the quantity and timing of completed tasks; the quality of responses and task results; and the profile, availability and reliability of performers. reactive rules for declaring events and triggers that control the crowd. The nice outcome is that by applying our methods you get significant advantage in terms of time, effort and quality. 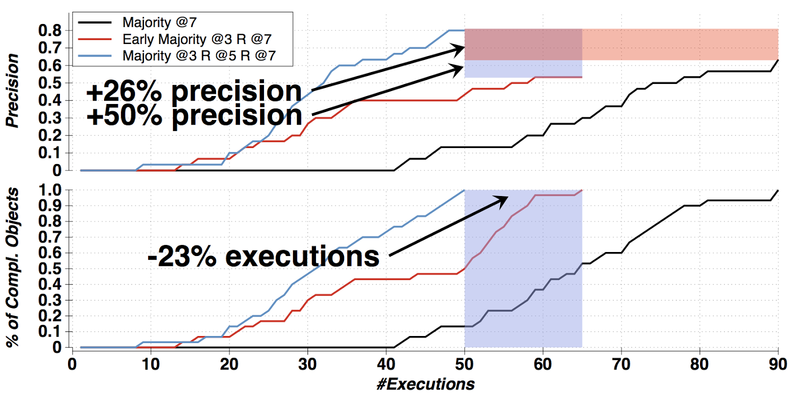 Some examples are reported in the figure below, showing up to 50% increase in precision of results and saving of more than 20% of executions, simply by changing the reactive rules for calculating majority. The full post is available on the Crowdresearch blog.